Of course, the media jumped all over the fact that stadium attendance was only for men. Some had the decency to state without prejudice that it was because religious Jews observe separation of the sexes, which even if viewed negatively in the secular world (teen pregnancies, rampant promiscuity, high extramarital affair and divorce rates notwithstanding) is nothing to be ashamed about. Nevertheless, most media outlets cited it in a ridiculing way. Perhaps the most obvious example of anti-religious invective, however, was the disproportional coverage given a small group of protestors. The highest estimate offered for the size of this group was 50 people. Even assuming 50 protestors, there were more than 60,000 participants at Citi Field and adjacent Arthur Asche stadiums. That yields less than one tenth of 1% (.01%). Applying that proportion to a 1,000 word article there should have been less than one word on the matter. Of course, when it comes to bashing religious Jews a single word would never suffice. The New York Times, for instance, used 75 of its 837 words (almost 10%) to describe it. 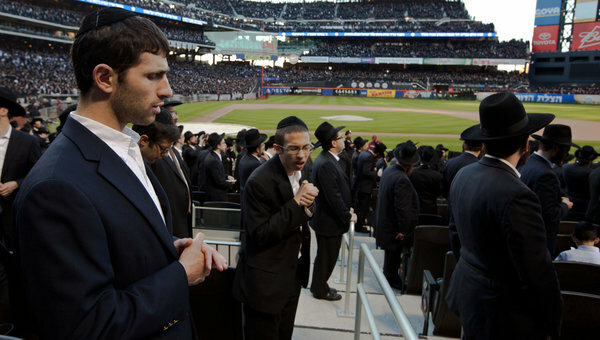 The Jewish Week (“Take Me Out Of The Ballgame”) allotted 246 of its 551 word article (more than 50%) to the protest! The major media outlets also offered video reports of the event. Even granting 10% would yield 12 seconds of air time allotted for the protest. Yet, in a 3:38 second BBC piece a full 76 seconds was devoted to it (30%). The New York Times had its own video segment where which allotted 1:51 of 2:51 to the protestors, a whopping 60% (!) of the coverage. No one says the religious community is perfect and that there are not issues that need to be addressed. But the evening was about addressing one issue, an issue that can be the cause of so many other issues: unrestricted internet use. This is a problem not only for religious Jews, but not-so-religious Jews and non-Jews as well. Yet, virtually no one reported it as such (the Boston Herald was a notable exception). It is only fair to ask: What was the cause of this deficient and diversionary coverage? I hope to discuss that next.